Bernie Sanders New Hampshire surge: Vermont senator starts to close the gap on Hillary Clinton. 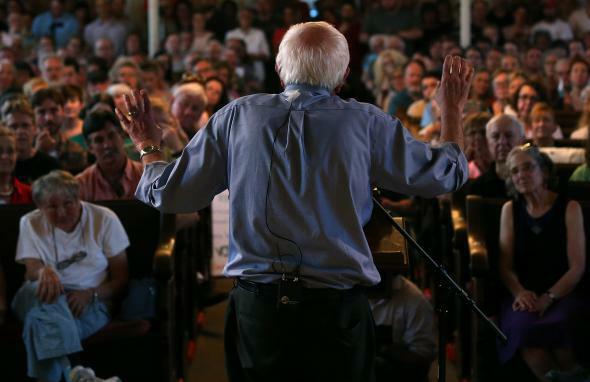 Sen. Bernie Sanders (I-VT) delivers remarks at a town meeting at the South Church May 27, 2015 in Portsmouth, New Hampshire. Another day, another sign of a Sanders surge in New Hampshire. A Suffolk University poll out Tuesday finds Hillary Clinton leading Bernie Sanders in the Granite State by a scant 10 points among likely Democratic voters, 41 percent to 31 percent. The latest survey comes only one day after a similar result in a Morning Consult poll, which pegged Clinton’s lead at 12 points, 44 to 32 percent. With those two polls factored into the RealClearPolitics’ rolling average—which is based on the five most recent state surveys—Clinton now leads Sanders 48.6 to 21.2 percent in New Hampshire, a cushion that would look significantly more comfortable to Clinton’s camp if she hadn’t begun the year with a 30-plus point lead on Elizabeth Warren and a 40-plus point lead on Sanders in the state. There won’t be any panic in Clintonland just yet, but Sanders strong polling is undoubtedly good news for his upstart campaign. The self-styled socialist appears to be cementing his hold on the anybody-but-Clinton vote as more liberals come to terms with the fact that Warren isn’t running, and as Martin O’Malley’s campaign continues to fizzle. (Sanders also should eventually be able to lay claim to some of Joe Biden’s supporters as soon as pollsters begin leaving the vice president out of the surveys.) If Sanders is eventually seen as Clinton’s only challenger, he’ll be afforded an even bigger platform from which to make that challenge. Already, he’s forcing Clinton’s hand in ways that no other Democrat has this year. The even better news for Sanders, though, is that recent polls suggest he may be finally starting to siphon off some support from the frontrunner, at least in New Hampshire. As I explained when Bernie-mentum first began, that’s the true test of whether Sanders can move from a long shot candidate to a legitimate challenger: Cutting into Clinton’s net lead means little unless Sanders can eat into her actual base of support. State polls aren’t always the most accurate—Suffolk’s had a margin of error of plus-or-minus 4.4 points; Morning Consult had one of 6 points—but these suggest that may be what’s happening. At the start of the campaign, if you would have asked me where Hillary was most likely to stumble early, I would have pointed to Iowa, where she lost to Barack Obama and John Edwards in 2008 on her way to losing the nomination. Bernie has been drawing large crowds in the Hawkeye State but, to date, hasn’t had anywhere near the same polling gains as he is now having in New Hampshire, where Clinton pulled out a surprise victory in ’08 and could get surprised again.